In the US, you can tell a lot about a family by looking at what's in their front yard: neatly clipped grass and seasonal flowers, sports equipment or children's toys. 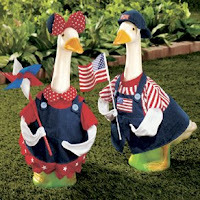 In the Midwest, you might see concrete "lawn geese" festively dressed for any upcoming holiday. What we do with the property around our homes expresses our values, our resources and our personalities. The same is true for all kinds of organizations, including agricultural research institutes! Last month I had a wonderful opportunity to visit the International Rice Research Institute (IRRI) in Los Banos, Philippines, which is about 90 minutes' drive southeast of Manila. IRRI is the world's leading research institute devoted to rice, a crop that feeds about half of the people on our planet. It is also the largest non-profit agricultural research center in all of Asia. So what's in the front yard of their headquarters building? Not high fences to keep people out. Not acres of lushly landscaped tropical plants to impress visitors. Not a big parking lot for hundreds of staff. Instead, IRRI's front yard (pictured left) is basically one big research farm. It contains plot after plot of new rice varieties that are being developed in pursuit of their mission "to reduce hunger and poverty, improve the health of rice farmers and consumers, and ensure that rice production is environmentally sustainable." One of these new rice varieties in IRRI's front yard is "Scuba Rice." It's called that because it can withstand two weeks of complete submergence under water and still recover enough to give a good harvest. According to Rice Today, farmers in Bangladesh and India lose up to 4 million tons of rice every year due to flooding -- which is enough to feed 30 million people! It doesn't all happen here. Much of today's agriculture research starts off in sophisticated laboratories, where genetic information about plants are analyzed and research is planned. And the most important field testing of new varieties happens in the tough real-world growing environments of farms all around Asia. But for the almost 50 years of IRRI's existence, the windows of their senior staff offices have looked right onto this particular piece of land. I like to think that this keeps IRRI scientists and administrators grounded in their mission, wherever it may take them. They have watched these fields growing right outside their offices -- day after day, season after season and year after year. IRRI staff have also watched the people who benefit from their research working these fields year after year. The day I visited, teams of workers from the local community around IRRI were beginning to harvest some of the research plots. These are seasonal contractors (mostly women) who come in just a few times a year to help out. Most of the time they are in their own fields, perhaps tending crops that resist disease or produce more because of research done here decades ago. Growing plants that feed your neighbors. What could be more inspiring than that in your front yard? that is very cool! When Matt was in Kenya, he said in Nairobi most front yards had vegetable gardens in them, and so did many street meridians. Such an awesome use of space. I'm pretty sure there are a lot of subdivisions here that wouldn't even "allow" you to do that because of architectural guidelines. too bad, hey? In Shane Claibourne's inner-city community in Philly, they grow gardens in abandoned lots on their street and on the roofs of buildings,he said so many of the kids didn't know that vegetables came from plants until they started growing food right in their neighbourhood.